Welcome to the Marianopolis community! As a parent, you are in a unique position to witness the transformative power of a Marianopolis education. On this page, you will find answers to some frequently asked questions and links to helpful resources. How can I learn about being a Marianopolis parent? Every Marianopolis student is considered an adult responsible for all aspects of their academic life. The transition from high school to college can pose challenges, as students learn to become more independent and parents take on a supporting role, rather than managing role, in their child’s education. 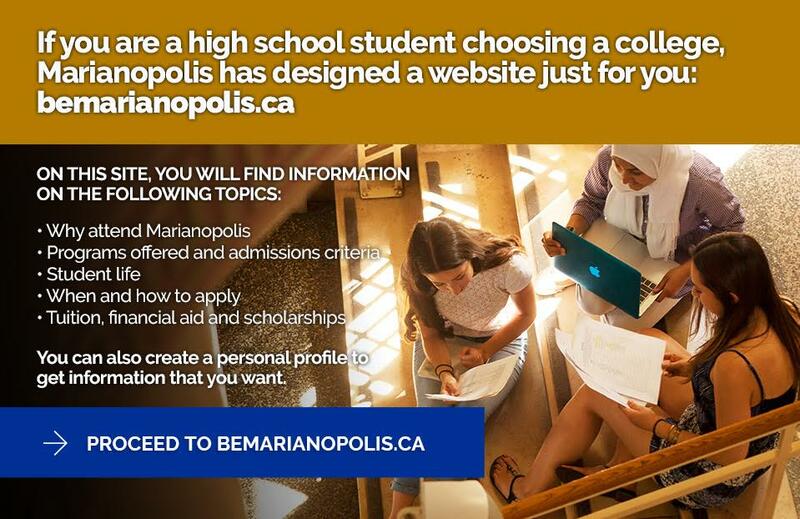 Each September, we hold Parent Information Evening to help parents learn how to support their Marianopolis student in their transition from high school to college and university. Where and how do I communicate with the College? If a student age 18 or older, or has not provided the College with written authorization, it is not legally possible to advise parents of any personal or academic information. The College takes the same approach for students under 18 as well. If academic concerns arise, the College reaches out to the student to provide support and options. While the College is unable to give parents information directly, appointments can be made where both the parent(s) and student are present so that any issues of concern can be discussed. Inquiries should be addressed to the Office of the Academic Dean at parents@marianopolis.edu, not to individual teachers. What support services are available to students? Marianopolis students have a plethora of support services to help them reach their potential and almost all of them are free. They can book appointments with academic advisors to discuss current or university studies; explore career choices or personal issues with counselors; get support in English or French literacy; or find a peer tutor for help with coursework. Librarians help boost research and citation skills. It is up to each student to seek these resources and ask for help. How much time should my child devote to school work? Students typically take 6-8 classes per semester and most classes are between 3 and 5 hours per week. This means that students spend less time in the classroom compared to high school, but it also means that the time spent in class is more critical. Students are also advised to study, prepare and work on assignments for about as many hours outside of class as they spend in class. In other words, being a college student is equivalent to having a full-time job. Do I have access to my child’s grades or R-Score? No. Grades are, however, posted on each student’s password-protected Omnivox account at two key points in the semester: the midterm assessment in the middle of the term and at the end of the term. Some teachers regularly update grades during the term. The College encourages parents to strive for an open relationship with their child so that they remain aware of their academic progress. Learn more about the R-Score. How can I support Marianopolis? With about one in five Marianopolis students receiving financial aid, the College welcomes parent volunteers and donations of any amount to The Marianopolis Millennium Foundation. The College’s Board of Governors also keeps a candidate pool of potential governors, including parents. A parent may be invited to join the Board when a vacancy arises and when their particular area of expertise is needed.